ROSEBRUGH, ABNER MULHOLLAND, surgeon, inventor, author, and social reformer; b. 8 Nov. 1835 in Dumfries Township, Upper Canada, youngest son of Thomas Rosebrugh, a farmer, and Johanna —; m. 27 June 1865 Ellen Bielby Reeve, sister of William Albert Reeve*, in Toronto, and they had two sons and four daughters; d. there 26 Nov. 1914. Abner Rosebrugh, of uel descent and a Wesleyan Methodist, began medical studies at the age of 18 at John Rolph*’s Toronto School of Medicine, where an elder brother, John Wellington Rosebrugh, was to obtain an md in 1855. During his five years at the school Abner would have received a sound education from such notable instructors as Walter Bayne Geikie, Charles V. Berryman, William Thomas Aikins*, William Canniff*, and Rolph himself. Formal lectures, on surgery, anatomy, physiology, chemistry, materia medica, midwifery, the diseases of women and children, pathology, and medical jurisprudence, as well as hospital demonstrations and other duties, commenced at 8:00 a.m. and concluded at 9:00 p.m. Proof of one year’s attendance at a general hospital was also a requirement for graduation. Despite an upheaval at the school in 1856 [see William Thomas Aikins], Rosebrugh obtained an md from Victoria College, Cobourg, in 1859 and left for further study in New York and London. By 1863 Rosebrugh had returned to Canada and set up a practice in Toronto. In that year he re-established the Toronto Free Dispensary, which made medical care available to those who could not afford it. One of the province’s first medical specialists, in ophthalmic surgery, he displayed a love of technology. After devising an instrument combining an ophthalmoscope and a camera in 1864, he and Toronto optician Charles Potter were able to photograph the fundus of the eye, one of the earliest successful attempts to do so. Rosebrugh also developed a new form of battery for medical purposes and wrote widely on the therapeutic action of electricity. Although galvanic and faradaic electricity would later become a discredited method of treatment, during the latter half of the 19th century it was used for a broad range of nervous and chronic pain complaints. Rosebrugh gave a lecture on a substitute for the stomach pump to the medical section of the Canadian Institute, and he made safer a technique for administering chloroform. He is also credited with having the first telephone line in Toronto, between his home and Potter’s, and of finding a method, adopted by the Bell Telephone Company of Canada, for transmitting telephonic and telegraphic messages simultaneously on the same wire. In 1867 Rosebrugh had opened the Toronto Eye and Ear Infirmary, which soon developed into one of the city’s most specialized medical care institutions. Provincial financial support, first secured in 1868, combined with subscriptions from Toronto citizens, ensured the viability of this hospital. Rosebrugh had been joined in the infirmary in 1867 by his brother-in-law Richard Andrews Reeve. They worked together until 1873, when Reeve left after a professional disagreement. Rosebrugh performed a range of ear and eye operations, including iridectomies and the removal of cataracts, at the infirmary. In keeping with his concern for the poor, he carried out these procedures at no charge. He also lectured at the medical department of Victoria College. As a result of his activities with the infirmary, Rosebrugh came into contact with John Woodburn Langmuir, the Ontario civil servant who was responsible for the Charity Aid Act of 1874, which solidified public support for hospitals. Through this association, Rosebrugh became deeply involved in social welfare reform. In 1874 he was a founding officer of the Prisoners’ Aid Association in Toronto, for assisting and counselling convicts previous to their discharge to ensure that they had adequate clothing, help them find employment, and, if necessary, obtain their transportation home. Rosebrugh also acted as vice-president of the National Conference of Charities and Correction, founded the Ontario Association for Reformation of Inebriates, and suggested to the National Council of Women of Canada that it should concern itself with the care and treatment of feeble-minded women of child-bearing age. This last activity was one of the first manifestations of the rise of a Canadian eugenics movement. 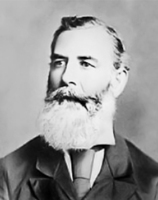 In 1890 Rosebrugh became involved in his most significant endeavour in the area of social welfare reform when he was appointed, at Langmuir’s suggestion, to a royal commission on the prison and reformatory system of Ontario. The commission’s report, described as one of the “outstanding documents in the literature of social welfare in Canada,” probed deep into the social roots of crime, drunkenness, juvenile delinquency, incarceration, and destitute children. One of its major conclusions was that much of the crime in Ontario originated from poor training of children at home. In addition to the testimony of many Ontario citizens, the commissioners heard the opinions of Thomas John Barnardo, who earlier had founded a series of children’s homes in England. An important recommendation was that every county in Ontario should establish an association to look after homeless and vulnerable children. Ultimately, it led to the formation of the Children’s Fresh Air Fund and the Toronto Children’s Aid Society. Rosebrugh’s career exemplified the major medical trends and concerns of his time. He witnessed the specialization of medicine, coupled with the increased use of technology, and his activities reflected the increasing concern over the “degeneration” of the moral fibre of Victorian society, especially among the “lower classes.” Rosebrugh’s mechanical aptitude was carried on by his son Thomas Reeve Rosebrugh, who was professor of electrical engineering in the University of Toronto from 1889 to 1936; their memory lives on in an engineering building named after them. Abner Mulholland Rosebrugh’s publications include “A new ophthalmoscope for photographing the posterior internal surface of the living eye; with an outline of the theory of the ordinary ophthalmoscope” and “The optical defects of the eye and their treatment by the scientific use of spectacles,” in Canadian Journal (Toronto), new ser., 9 (1864): 81–92 and 11 (1866–67): 1–31; Strabismus: its pathology and treatment (Toronto, 1867; copy at AO); Chloroform and a new method of administering it (Toronto, 1869; a New York edition was also issued the same year); On some practical points in the treatment of those forms of eye disease of most frequent occurrence in general practice (Toronto, 1876); “Electro-therapeutic apparatus,” “Electrotherapeutics,” “Electricity in the treatment of special diseases,” and “A new medical battery,” all in Canada Lancet (Toronto), 12 (1879–80): 327–30, 355–58; 13 (1880–81): 161–67; 14 (1881–82): 97–101, 129–32; and 15 (1882–83): 193–95, respectively; “Photographing the retinal image impressed on the living fundus oculi,” in Canadian Practitioner (Toronto), 12 (1887): 165–67; and Recent advances in electro-therapeutics: electricity in gynecology (Toronto, 1888). AO, RG 22-205, no.494; RG 80-27-2, 67: 82. UTA, A73-0026/374(64), /386(32–34). Victoria Univ. Arch. (Toronto), 87.143V (Victoria Univ., Registrar’s office, student records), no.1 (reg., 1851–52); 87.251V (Victoria Univ., reg. of graduates of all faculties during the Cobourg period). Globe, 28 Nov. 1914. Canada Lancet, 5 (1872–73): 266; 6 (1873–74): 56–58, 122. Canadian men and women of the time (Morgan; 1912). W. G. Cosbie, The Toronto General Hospital, 1819–1965: a chronicle (Toronto, 1975). Willoughby Cummings, “The problem of the feeble minded,” Public Health Journal (Toronto), 5 (1914): 229–30. Dominion Medical Journal (Toronto), 2 (1869–70): 48–49. L. D. Fraser, “Phoenix: medicine at Victoria, 1854–1892,” Vic-Report (Toronto), 2 (1974), no.5: 6–7. Ont., Commission appointed to enquire into the prison and reformatory system of Ontario, Report of the commissioners (Toronto), 1891. H. G. Simmons, From asylum to welfare (Downsview [North York], Ont., 1982). R. B. Splane, Social welfare in Ontario, 1791–1893; a study of public welfare administration (Toronto, 1965). Victoria College, Calendar (Cobourg, Ont. ), 1856/57–1883/84, continued as Victoria Univ., Calendar (Cobourg; Toronto), 1884/85–1892/93. J. T. H. Connor, “ROSEBRUGH, ABNER MULHOLLAND,” in Dictionary of Canadian Biography, vol. 14, University of Toronto/Université Laval, 2003–, accessed April 24, 2019, http://www.biographi.ca/en/bio/rosebrugh_abner_mulholland_14E.html.